Add a little heat to your weekend parties with just the right amount of spice in these fun and tasty bite-sized appetizers. Wash mushrooms well, remove stems, and set caps aside. Finely chop about 1/2 the mushroom stems. 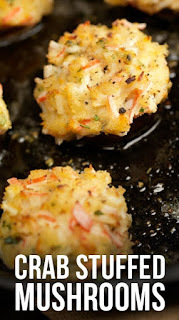 Mix cheese, crab, chopped stems, lemon juice, Worcestershire sauce, basil, garlic powder, onions, and lemon pepper. Bake at 450ºF for 15-20 minutes and serve warm.